I was travelling to Kochi, Kerala to conduct a 6 day session on NAV 2013 R2 topics to a bunch of guys from one of the Microsoft Partner. it was 3 months back and as client requested to demonstrate the topics in NAV 2013 R2, I upgraded my laptop with NAV 2013 R2 from NAV 2013 FP1. Normally I ensure to keep all dependent software of NAV installed right in my laptop. But this time I missed out the fact that NAV 2013 R2 is no longer compatible with Visual Studio 2010. Rather it needs VS 2012 or higher. Now I got a situation here as I even don’t have the installable of Visual Studio 2012 / 2013 and I need to demonstrate the report designing features to my audience. Fortunately with my installation of NAV 2013 (R2), the SQL Server 2012 express version was installed and along with that, the Report Builder 3.0 too was got installed in my Lapi. Though I was more comfortable in designing the reports in Visual Studio, but I quickly adapted to the new environment and managed the show perfectly. And trust me my audience was happy . 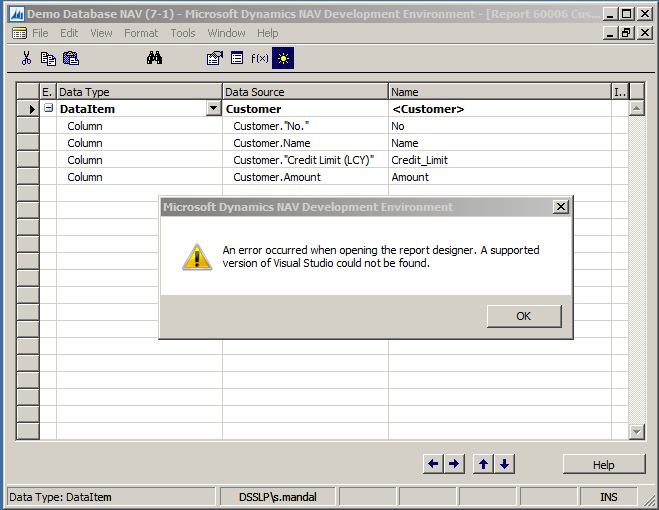 NAV 2013 R2 no longer uses Visual Studio 2010 for report layout design. Rather it looks for Visual Studio 2012 / 2013. If you don’t have the Visual Studio 2012 / 2013, you can still manage to design the report using Report Builder 3.0. This is a component of SQL server 2012 reporting services and gets installed when you install SQL server 2012. Among the 2 report authoring tools, Visual studio is still the default report authoring tool. So even though you have the Report Builder 3.0 in your machine, you will see that NAV 2013 R2 is looking for Visual Studio 2012 / 2103 and still throwing the above mentioned error (picture). 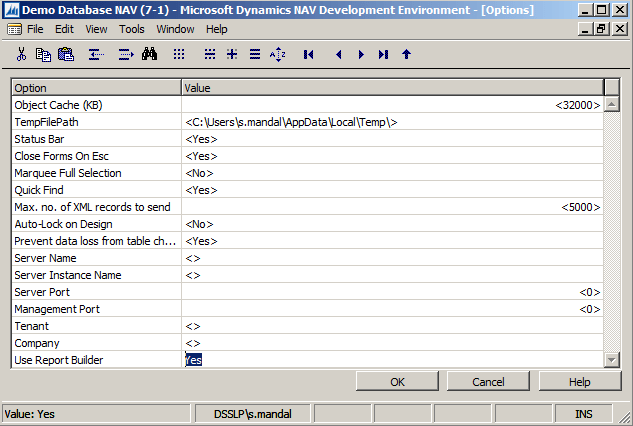 Open NAV 2013 R2 development environment. Change the ‘Use Report Builder’ property to ‘Yes’. The default value will be ‘<No>’. Once this is done, NAV 2013 R2 will no longer look for Visual Studio 2012 / 2013 and will open the Report Builder 3.0 for designing the report layout. Enjoy Reading. I will come back with more topics on report designing soon. bye for now.